For a man who says “I never set out to be a biographer,” music historian Peter Guralnick has done pretty well. His 1994 two-volume Elvis Presley biography “Last Train to Memphis” and “Careless Love,” is considered the definitive telling of the King’s life story among dozens if not hundreds of other writers’ books devoted to Presley’s life and music. 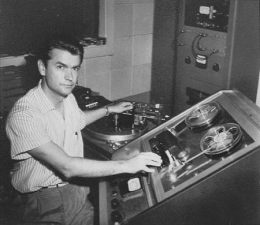 And now he’s just published his book on a man who is neither a household name in the world of popular music nor even a musician but who arguably deserves as much credit for the birth of rock ‘n’ roll as anyone else: Sun Records founder Sam Phillips. 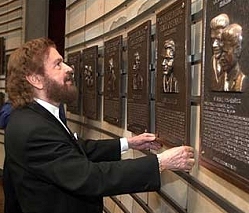 Sam Phillips to be inducted into the NATIONAL RADIO HALL OF FAME at their 18th annual induction ceremony. Approximately 350 radio executives, personalities, and celebrities were at the affair November 6th, in Chicago. T hen in the summer of 1953 a painfully shy young truck driver wandered in to record a couple of sentimental songs for his mother. 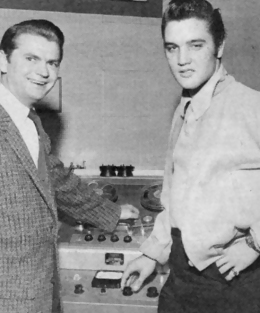 He hung around over the next few months, and Phillips made a mental note of the young man with the strange name and even stranger appearance, Elvis Presley. There was something in that voice, he thought. Phillips was solicitous of just such unpolished talent. Indeed, he had staked his tenuous fortune on the artistic enfranchisement of the poor and the racially marginalized–those who had never had the opportunity to record. Phillips mentioned Presley to a couple of session men and finally decided to call the kid in. A fter a lack-luster afternoon performing a repertoire of pop songs and ballads, Presley idly picked up his guitar and began to play around with a blues song, “That’s Alright Mama.” This anonymous moment with the microphone turned off could so easily have signified nothing.